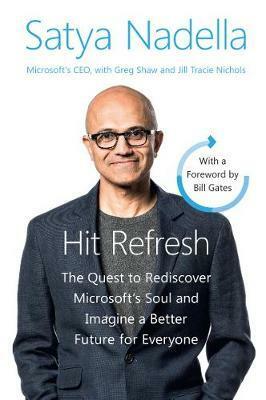 The New York Times bestseller Hit Refresh is about individual change, about the transformation happening inside of Microsoft and the technology that will soon impact all of our lives-the arrival of the most exciting and disruptive wave of technology humankind has experienced: artificial intelligence, mixed reality, and quantum computing. It's about how people, organizations, and societies can and must transform and "hit refresh" in their persistent quest for new energy, new ideas, and continued relevance and renewal. Microsoft's CEO tells the inside story of the company's continuing transformation, tracing his own personal journey from a childhood in India to leading some of the most significant technological changes in the digital era. Satya Nadella explores a fascinating childhood before immigrating to the U.S. and how he learned to lead along the way. He then shares his meditations as a sitting CEO-one who is mostly unknown following the brainy Bill Gates and energetic Steve Ballmer. He tells the inside story of how a company rediscovered its soul-transforming everything from culture to their fiercely competitive landscape and industry partnerships. As much a humanist as engineer and executive, Nadella concludes with his vision for the coming wave of technology and by exploring the potential impact to society and delivering call to action for world leaders. "Ideas excite me," Nadella explains. "Empathy grounds and centers me." Hit Refresh is a set of reflections, meditations, and recommendations presented as algorithms from a principled, deliberative leader searching for improvement-for himself, for a storied company, and for society. After Joining Microsoft in 1992, Nadella quickly became known within the company as a leader who could span a breadth of technologies and businesses to transform some of the world's best known and most used products. Originally from Hyderabad, India, Nadella now lives in Bellevue, Washington. He holds a bachelor's degree in electrical engineering from Mangalore University, a master's degree in computer science from the University of Wisconsin, Milwaukee and a master's degree in business administration from the University of Chicago. Nadella is married and has three children. In his spare time, he loves to read poetry and follows cricket, a sport he played in school.